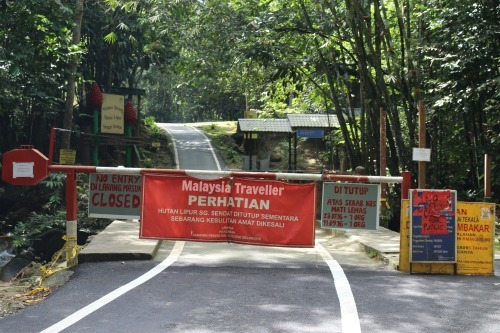 Sungai Sendat Forest Park is closed to the public from 24 July 2016 until further notice due to safety reasons. I was hoping to enjoy a day out at this scenic park and waterfall during my recent visit (February 2017). Unfortunately when I arrived I found the entrance to the park blocked with a number of signs warning the public that it was closed due to safety reasons. One notice said that drowning deaths had occurred at the waterfall on 23 July 2016 and again on 11 September 2016. I believe these accidents took place at the upper part of the Sendat fall. Since there was also a sign saying that the Selangor Forestry Department will not be responsible for any accidents I thought it was one of those cases where you could enter at your own risk and since my visit was on a weekday I assumed there would be nobody around to stop me entering. However I was wrong. An employee in the park office saw me and prevented me from entering which I suppose is a good thing as they are taking safety seriously although I only wanted to take a few photos for this page. Instead I took this photo next to the river just outside the gates to the park - not a bad spot for a picnic or dip. There was no indication if or when the park will be reopened. 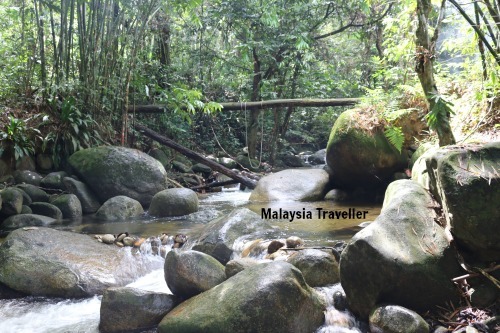 Sungai Sendat Waterfall is a popular recreational forest in the Ulu Yam Baharu district of Selangor state. 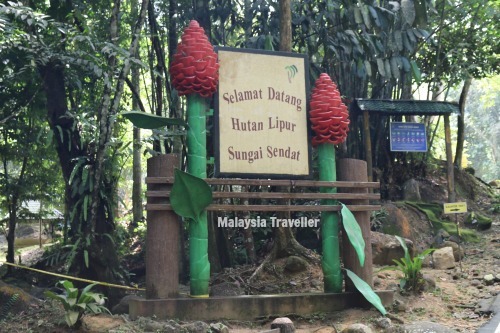 It is also known as Hutan Lipur Sungai Sendat and is managed by the Selangor State Forestry Department. Activities and facilities here include camping, picnicking, BBQs and bathing in the clear cool water of natural river pools and cascades amid the tall tropical rainforest trees. Open Daily 8am - 5pm (unless camping). Entrance Fee Adult RM 1, Child RM0.50. 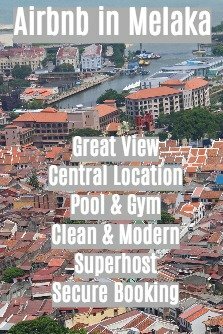 Hall Rental RM 100 per day. Call the Selangor State Forestry Department for updates on when the park will reopen. It is easy enough to find. 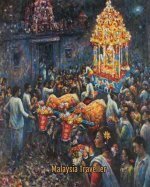 Take route B23 Jalan Hulu Yam Bharu - Batu Caves. From Batu Caves you go past Empangan Batu reservoir, then past Sungai Tua Recreational Forest and continue until you reach a T junction at Taman Desa Kaloi / Kampung Gurney. At the T junction turn right and follow the road all the way to the Sendat Waterfall. Limited parking is available.